It’s hot outside! Cool off with a cold treat. These five ice cream treats are definite crowd pleasers, so we’re sure your family will love them! Start these delicious sandwiches off with your favorite chocolate chip cookie. You can use store-bought or homemade, but a soft, chewy cookie works best. Lay one cookie with the bottom facing up and spread a scoop of ice cream on the cookie. 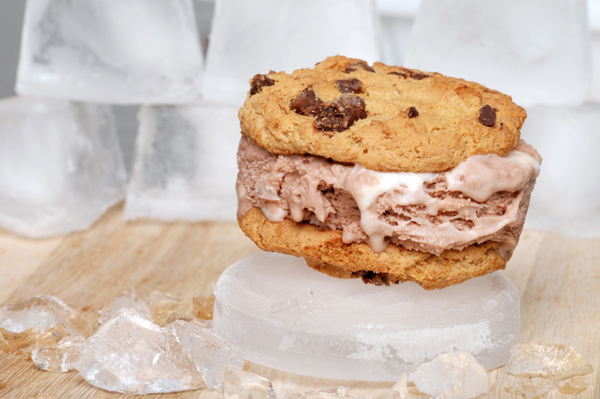 Place a second cookie on top of the ice cream to complete the sandwich. If you like, roll the sandwich in chocolate chips or sprinkles on its side, so the sprinkles stick to the ice cream. Fried ice cream is a special treat. The combination of hot and cold makes this dessert hard to resist. Using a large ice cream scoop, scoop ice cream onto a cookie sheet. Make one scoop for each treat you need. Place the cookie sheet in the freezer for about 10 minutes, just until the scoops firm up. While you’re waiting, crush the cereal. Remove the scoops from the freezer and coat them in cereal. It’s not easy to roll the scoops, so you’ll probably have to pat the cereal into the scoops with your hands. Once you’ve covered all the scoops in cereal, put them back into the freezer to harden up again. When you’re ready to serve them, place them under a broiler for just 30 seconds, and then remove them from the oven. Drizzle with chocolate syrup before serving. There’s nothing wrong with a standard root beer float, but this one adds a touch of chocolate for an unexpected twist. Place a few scoops of ice cream into a tall glass and add a generous amount of chocolate syrup (about 3 tablespoons). Fill the glass with root bear. Top it with whipped cream and chocolate sprinkles (optional). Serve immediately. No two flavors are more fitted for each other than chocolate and peanut butter. This frozen treat takes those two flavors and adds delicious vanilla ice cream, making it even better. Make two batches of your favorite brownies. It doesn’t matter what size pan you use, but both batches need to be exactly the same size. Take one batch out of the pan by gently loosening the edges with a spatula, then placing a cooling rack over the pan and flipping it over. Leave that batch upside down on the rack and cover the bottom of the brownies with a layer of peanut butter. Set the peanut butter brownies aside. Spread vanilla ice cream on the batch of brownies that is still in the pan. For easier spreading, place the brownies in the freezer for 20 minutes before spreading, and let the ice cream soften slightly. Hold the peanut butter brownie over the ice cream brownie, and carefully flip it over, placing the peanut butter layer against the ice cream layer. Press gently to make sure the layers stick, and place it in the freezer for at least 30 minutes before serving. We all love cake and ice cream. This simple dessert saves a step by keeping them together from the start. Use a large ice cream scoop to get nice, round scoops of ice cream and place them directly on top of the un-iced cupcakes. Make these treats more your style by swapping out vanilla for your favorite ice cream flavor.